The good news is that you can successfully escape a sinking vehicle, but you have to act quick and move fast. When you’re seized with panic and terror, it’s not the time to be figuring this out for the first time, so understanding and remembering the steps to vehicle submersion survival is crucial in the precious seconds you have, where your life hangs in the balance. You’ll have 30 seconds—a minute at most, to get yourself (and your passengers) out alive. What do you do? 1. Don’t touch your phone or attempt to call for help until you make it out of your car. Time is critical, and every second you have should be spent getting out safely. By the time rescuers get to you, it would be too late as your vehicle will likely be completely submerged. 2. Don’t try to open the doors. It’ll be almost impossible to do so against the water pressure, and it will sink the car even faster. 3. Don’t wait for the vehicle to sink further and fill with water to equalise the pressure, so that you can open the car door to escape. You would have to wait for all the air to clear out of the car trunk too before it equalises, which would likely be too late. The first thing to do is to get your restraints off as quickly as possible—unbuckle. Next, and as counter-intuitive as it may be, get a window down. Most modern vehicles use power windows which aren’t guaranteed to work under water, but they should work within the first few moments of submersion. Experts say you’ll have 30 seconds to a minute before the water rises to a point where water pressure will force the window against the doorframe, making it impossible to roll down. This is why getting a window down precedes even getting to your child who may be in a car seat at the rear. If you can’t get your window down, you’ll have to break it. A popular tool is the ResQMe keychain, which uses a spring-loaded mechanism to shatter glass. They won’t work underwater, so make sure your escape tools are within quick reach at all times so they can be utilised in time. If your headrests are removable, you can also use it to smash your windows, although this will require a degree of force and will not be as quick or effective as a window-breaker. If you have children in car seats, unbuckle them, from oldest to youngest. The older kids have a higher chance of escaping and surfacing on their own, so have them escape in that order. 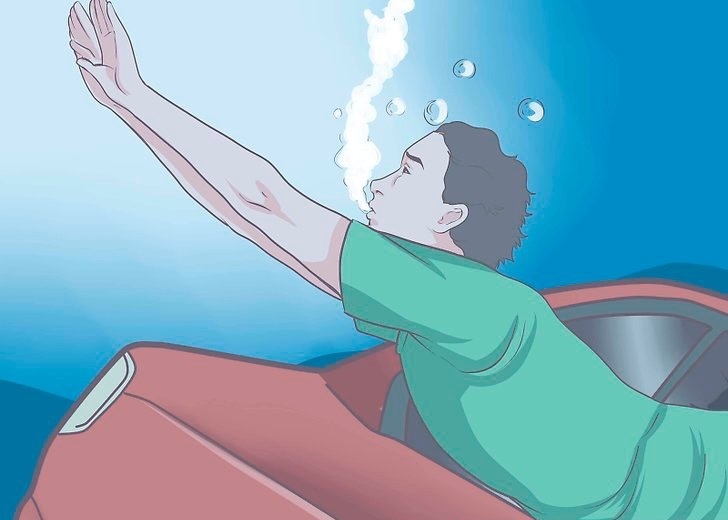 The key to saving your kids in a sinking vehicle is to get them out before you do, as it is extremely difficult to do so if you get out first. It will be intimidating, fighting against the torrent of water pouring in, but experts encourage you to push through as it can be done. It can be easy to lose orientation in turbid waters; to understand where to swim underwater, swim in the direction of rising air bubbles. If you could not get out through the windows, there is still a sliver of hope left. Once water fills the car’s interior, the pressure will equalise and you will be able to open the door. When this happens, take a deep breath of the last air you have, open the door and get out. So, just to recap: SEATBELT, WINDOW, OUT: children first. We should all consider this tragedy a wake up call. Don’t wait to learn how to escape a sinking car.